Based in Bavaria, Germany, Stürmer Maschinen supplies approximately 2,000 specialist dealers in Germany and a growing number of foreign partners in nearly all European countries with metalworking and woodworking machines, compressors, welding and workshop technology. With the inauguration of a new logistics centre with 16,000 m2 of storage space, the company also decided to replace its entire forklift fleet. The new logistics centre is used to keep more than 345,000 items ready for immediate delivery to industrial customers and trade specialists. The range of products includes some 20,000 machines in the above-mentioned product segments, as well as 225,000 accessories and 100,000 spare parts. In order to meet the company’s target of delivering just-in-time to customers across Europe and to enhance customer satisfaction, the new centre needed fast and flexible material handling equipment. It was important to build a new forklift fleet selected to accommodate their specific workflow to achieve the highest standards of efficiency and productivity while keeping the total cost of ownership as low as possible. To better understand the customer’s processes and needs, Crown started the tendering process by carrying out a comprehensive on-site analysis of the Stürmer requirements resulting in a solution in which every single forklift was optimised to satisfy the specific requirements in its particular area and activity. The final proposal included Crown’s double stacker series DT 3000, ideal for intensive transport operations between loading docks and warehouse. These were joined by platform stackers with initial lift from the ETi 4000 Series – highly manoeuvrable even in very tight spaces – and the reach truck series ESR 5200 for handling pallets efficiently at high elevations. When Stürmer evaluated the various solutions’ cost-benefit ratios in real-world conditions, Crown’s products performed particularly well. In addition, the operators were impressed by the trucks’ outstanding ergonomics, quiet operation and robust construction, as well as the attractive appearance. The decision to select Crown was unanimous. 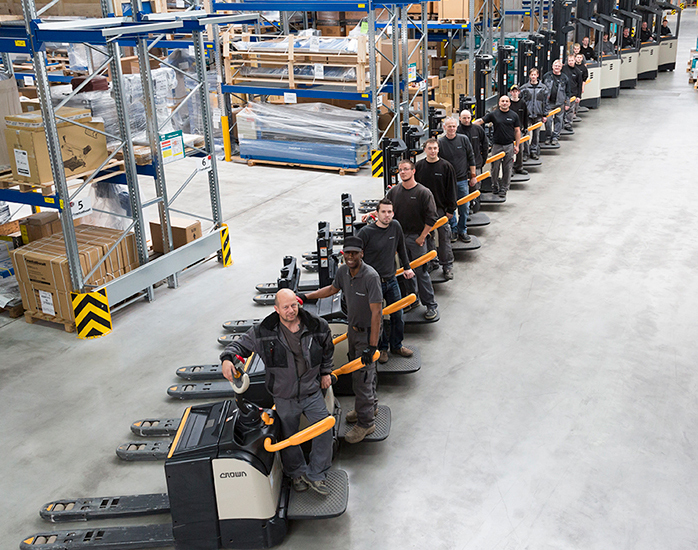 Stürmer opted for a bespoke mix of Crown forklifts, investing in a total of 27 new vehicles. > Achieved greater efficiency with the implementation of a new forklift fleet of the right size with the right trucks in the right applications. > Obtained added-value and higher operator confidence, even when working at a high pace, by close attention to ergonomic detail and operator safety to reduce physical stress and strain. > Experienced smooth integration into existing Stürmer processes through careful matching of each truck’s capabilities to workflows and activities. The company’s global headquarters is located in New Bremen, Ohio, USA, with regional headquarters in Germany, Australia, China and Singapore. Its employees number more than 13,000 worldwide. Crown operates a service and distribution network that exceeds 500 retail locations in over 80 countries. To learn more about Crown’s ideas for helping customers advance the productivity of their operations, visit crown.com.